We collect both Personal Information and Other Information about visitors to our Site, as described below. For purposes of this Policy, “Personal Information” means information we can directly associate with a specific person without any additional information, such as an email address. “Other Information” means any information that is not Personal Information. We may combine Other Information and Personal Information, in which case we will treat the combined information as Personal Information. We may also combine Personal Information or Other Information we have about you with additional information that we or third parties collect in other contexts – like when we communicate with you by email. In those circumstances, we will treat the combined information in accordance with this Policy. Other information you choose to provide to us in your email or in association with a job application. Server Logs. When you use the Site, we automatically receive and record certain information from your computer or other device and your browser. To obtain such information, we may use server logs or applications that recognize your device and gather information about its online activity. Our Site currently does not respond to “do not track” browser headers or similar signals. For any other purpose permitted by law, including any purpose for which we use Personal Information. Gotham Entities. We may also share your Personal or Other Information with current or future Gotham affiliates and/or subsidiaries for any of the purposes described in this Policy. Business Partners. We may also share your Personal Information or Other Information with our business partners to fulfill your requests for service, complete a transaction that you initiate, or meet the terms of any agreement you have with us or our business partners. Third-party service providers. We use third-party service providers to help us host, maintain, operate, and improve our Site. Acting under our instructions, these service providers may collect or use your Personal or Other Information to assist us in achieving the purposes described in this Policy. For example, we may use third parties to collect information about visitors to our Site and report it to us. We may also use third parties (such as Constant Contact) to send our email updates. Analytics. We may engage third parties to collect, analyze, and use some of the information described above. For example, we may allow third parties to collect Other Information through cookies or pixel tags on the Site or in email communications from us for analytics, auditing, research, and reporting purposes. These third parties may use web logs, pixel tags, or other tracking mechanisms and they may set and access cookies on your computer or device. Our Site uses Squarespace Analytics to help collect and analyze certain information for the purposes discussed above. De-identified or aggregated information. We may also create and share de-identified or aggregated information about Site users, such as by creating reports on trends in the usage of the Site. This information does not identify individual users. opt-out of any regular email communications you might receive from us. You can also follow the “Unsubscribe” instructions in any email you receive from us to stop receiving email updates from us. The Personal Information and Other Information we collect through or in connection with the Site is transferred to and processed in the United States. We may also subcontract the processing of your data, or otherwise share your data with, third parties in the United States or countries other than your country of residence. The data protection laws in these countries may be different from, and less stringent than, those in your country of residence. By accepting this Policy, using the Site, signing up for email updates, or providing information us, you expressly consent to such transfer and processing. This Policy covers only our Site, and does not cover third-party sites that may be accessible from our Site. Such third-party sites are governed by the privacy policies of the companies that maintain them. Our Site has security measures in place to protect the security and privacy of any of your information that you provide to us. Notwithstanding the security protections that may be implemented by us and our hosting providers, no website is 100% secure and we cannot guarantee the physical or electronic security of your information. The Site is not directed to children under the age of 13, and Gotham does not knowingly collect Personal or Other Information through the Site from anyone it knows is under the age of 13. 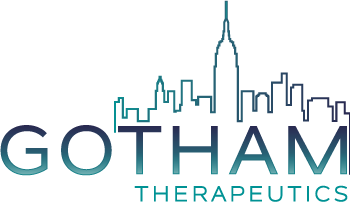 Access to and use of this website provided by Gotham Therapeutics (hereinafter referred to as "Gotham" or "we") is subject to the following terms. Please do not use this website if you do not agree with these terms. Gotham reserves the right at any time and without notice to change this website and the Terms and Conditions of Use in whole or in part and/or cease the website’s operation and is not obliged to update the website. Gotham provides a wide range of information, documents, and illustrations on this website that are expanded and updated regularly. You can save this information and create links to these pages. If links are created by commercial providers, the webpage must be the only element shown in the opening window. The information provided on this website may not be altered or falsified. We cannot accept any liability for damages arising from the direct or indirect use of this website, especially any liability for the timeliness, completeness, accuracy, and quality of the information on this website as long as it is not based on intent. For this reason, information received from this website should be verified before it is used. Users of this website declare that they agree to access the website and its content at their own risk. The complete content and design of our website (e.g., text, images, graphics, presentations, animations, video recordings, logos and trademarks) are protected by trademarks and copyrights as well as other rights which protect intellectual property. Unauthorized use of this content and trademarks is explicitly prohibited. This website also contains links and references to third party websites. The links on third party websites are researched and compiled with the greatest possible care. However, we have no influence on the current and future design and content of linked web pages. We are not responsible for the content of the pages linked and do not agree with the pages’ content or appropriate this content for our own use. Illegal, false, or incomplete content on third party websites and any damages arising from the use or non-use of the information is the sole liability of the provider responsible for the website to which reference is/was made. No liability can be accepted by the party who merely draws attention to the publication by displaying a link. The choice of links should in no way restrict users to using only the information provided on the linked website. Should you find content or images on external links which provide grounds for objection, or if you cannot access the address of the link we have provided, please inform us by using the contact information listed in the imprint so that we may check the link’s information. This website contains certain forward-looking statements concerning the Gotham Group. These statements represent the opinion of Gotham at the time of publication and involve specific risks and uncertainties. Should there be a change in the conditions underlying the Company’s assumptions, actual results and actions may differ from those anticipated. Gotham assumes no obligation to update these forward-looking statements or to adapt them to future events or developments. Any legal claims or proceedings arising in connection with the website or its use are subject to US law under exclusion of the regulations of international civil law and the UN Sales Convention.